The Retro Stereo 50 Vacuum Tube Amplifier from iFi AUDIO utilizes four EL84X and two ECF82 tubes with an advanced ground-up circuit and is equipped with a Burr-Brown DAC chip to output up to 25W per channel. 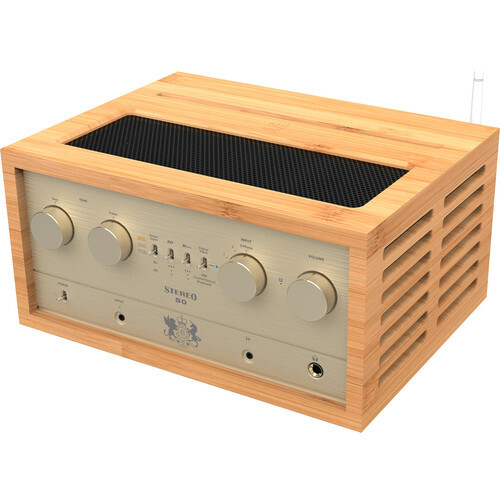 It features connectivity for both analog and digital audio devices, with stereo RCA, optical/coaxial combo, and USB inputs. Smart devices with Bluetooth are also supported, with aptX for high-fidelity wireless streaming from supported devices. NFC makes the pairing process easy. The Stereo 50 also has separate 3.5mm and 6.3mm headphone outputs, each with dedicated gain and sensitivity, to work with a wide range of both over-ear and in-ear headphones. The Stereo 50 features four EL84X and two ECF82 analog tubes with an advanced ground-up circuit. Running primarily in Class A, its 25W per channel output provides both power and realism to your music sources. The tubes can be removed and replaced if you wish to customize the sound. Bluetooth aptX offers CD-like-quality wireless audio beyond normal Bluetooth. High-resolution audio is supported via USB, coaxial, and optical inputs. It supports PCM from 16-bit/44 kHz up to 32-bit/768 kHz, DSD up to Octa-DSD512 (22.6/24.6 MHz, and DXD 2x to 768 kHz. The minimum phase filter for PCM and bit-perfect filter for DXD/DSD ensure maximum enjoyment with a smooth and organic tonality. The Burr-Brown DAC chip uses trickle-down technology from AMR to give your digital music a classic, analog sound. The Stereo 50 uses separate 1/4" and 1/8" headphone outputs, each with its own dedicated gain and sensitivity to match high-sensitivity in-ear monitors and low-sensitivity over-ear headphones respectively. The 1/4" output pumps out 7000mW to power high-impedance headphones. The 3D Holographic for Headphones technology uses pure analog signal processing to deliver a wide-open and spatially correct sound stage for headphones to enhance the listening experience. XBass dynamically corrects the bass response. The MM/MC phono input has an adjustable ultra-wide gain from 38-62 dB and its tone control invokes classic equalization technology. With 6 different EQ curves (via the precision tone control), every stereophonic record is catered for, from the default RIAA to EMI and Decca. The noise floor of the Stereo 50 is below (as opposed to above) that of the record. Digital volume controls truncate the delicate audio signal, so the Stereo 50 uses analog tone and volume control. A motorized Alps potentiometer controls the volume with a less than 3 dB tracking error. A remote control is included for use from your couch. Box Dimensions (LxWxH) 17.2 x 12.5 x 10.0"